EnvShaper-RE is a highly usable mix utility for producers of any level of experience. What it does is easy to understand, and it affords a much greater degree of control over a sound than many traditional dynamics processors. For €25, this is a no-brainer for Reason users looking for an easy way to get better-sounding mixes. Ease of use. Good degree of control. Sounds great. Affordable. The latest Reason Rack Extension from FXpansion is another of its analogue-modelled DCAM effects, specifically the transient processing EnvShaper from the DCAM Dynamics plugin suite. "DCAM EnvShaper RE is a straightforward plugin in terms of interface, but the SPL Transient Designer-style processing that goes on under the hood is pretty clever"
DCAM EnvShaper RE is a straightforward plugin in terms of interface, but the SPL Transient Designer-style processing that goes on under the hood is pretty clever, and it makes getting the perfect level of snappiness in any kind of percussive sound (from beats to guitar, piano and synths) a breeze. 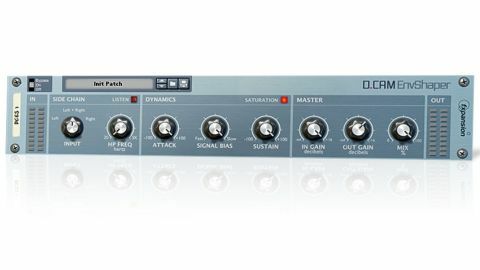 The Dynamics panel is where you access EnvShaper RE's core functionality, and it's a simplistic affair: you get an Attack knob that controls the aggression or mellowness of the attack phase, a Sustain knob that can be used to subdue or enhance the sustain phase after the attack, and a Signal Bias knob that controls how sensitive the effect is to fast and slow transients. Using the Dynamics panel is easy: simply dial in the Attack and Sustain as you see fit, adjusting the Signal Bias to get a different feel. Depending on the audio input, extreme Attack or Sustain values might cause the signal to break up, but this can be fixed by finding an appropriate Signal Bias setting. Even without resorting to the manual, getting your head around the basic operation is quite straightforward, and you can get a good idea of what the effect is capable of within seconds of firing it up. The Dynamics panel also has a Saturation mode, the behaviour of which is dependent upon the input level. Input, Output and Wet/Dry mix knobs can be found in the simple Master panel, and the input signal can be controlled in more detail with the Side Chain panel, which offers a choice of left input, right input or left- plus-right input, with optional high-pass filter.